Exclusive for the PlayStation 3, Gran Turismo 5 has now hit shelves in the US. And for the first time the game is playable in stereoscopic 3D, taking video gaming to the next level of immersion. Developers Polyphony Digital have also improved the game in many other ways including real-time car damage, dynamic weather effects, inclusion of some NASCAR models, kart racing, a Course Maker and online community options. In addition, Gran Turismo 5 brings a lineup of over 1,000 licensed cars and over 20 tracks and 70 variations — race in the city, snow and dirt, classic courses and famous circuits. 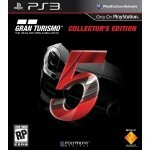 Gran Turismo 5 is available in both the Standard and Collector edition for $59.99 and $99.99 respectively. Click here to purchase.